Just back from accompanying a great group of musicians to perform for our neighbors to the north. “Crossroads: Music Traditions of New England” was New England’s contribution to Québec 400, a year-long celebration marking the 400th anniversary of the city’s founding. Crooked Still represented Massachusetts and Nightingale Vermont . Rhode Island sent the Pegheads, Connecticutt it’s state troubador, Pierce Campbell. Maine was represented by Nipmuc flutemaker/player Hawk Henries and New Hampshire by dance fiddler Rodney Miller (a National Heritage Fellow), David Surrette, and accordion wiz Gary Sredzienski. Above you see everyone squeezed on stage for a finale. 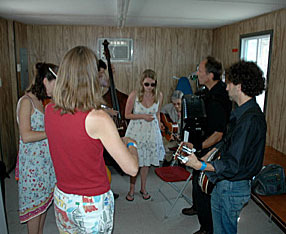 The event took place at Espace 400 on the banks of the St. Lawrence River. 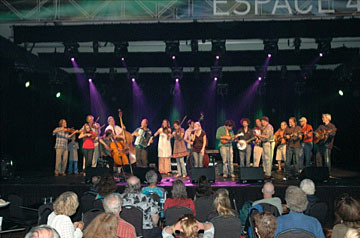 A full day of traditional tunes and songs, some with strong Franco-American influence, culminated with everyone on stage. Just minutes after closing, we were all treated to Robert LePage’s incredible sound and light installation projected on the grain silos across the river. 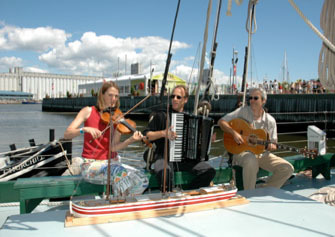 The Québecois know how to enjoy life!